Grayson (pictured on right) is a special needs kitty. He has longhair with beautiful sweet green eyes. His approximate birth year is 2010. Grayson is a very friendly, loving cat. One of his favorite things is popcorn! Grayson has an extreme case of cerebellar hyperplasia, which causes him to wobble and flop over often while walking. Despite this, he is a happy and friendly cat that loves to be held and petted. We rescued Grayson from a hoarding/neglect situation late last summer. He is doing well now and is ready for a very special home. This boys been through a lot and we fear he won't get a home due to his special needs. If you are someone who appreciates special needs kitties please contact us. We'd love to have you come out and meet Grayson!! 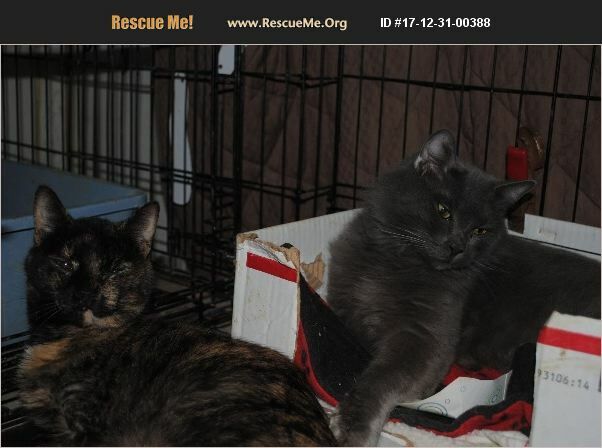 Speckles (left) pictured with Grayson is also a wobbler and also up for adoption. The two don't have to go together (though of course it would be awesome if they did).